It has been really annoying lately, waiting for the new version of bukkit to be released. Bukkit is very hard at work building the recommended build for 1.4 and just announced that they are releasing 1.3.2(R3). But most people have upgraded to the newest version. So while I am eagerly waiting for bukkit 1.4 to released, we just have to wait until it shows up on their site. I am constantly waiting for it to show up in my reader account, and once it does, I’ll be upgrading to get all of my players back online. If you are still with us when we get around to updating, there won’t be many changes soon. Since I am in school, I have very little time outside of work and school to manage my server, along with everything else here. But we do have some long term goals. We will be moving the server and isolating it from the AGOA’s main physical server. Because of DNS issues, it will require a nameserver change. So the minecraft server will no longer be at agoasite.com, it will be moved to minecraft.agoasite.com. Not a big issue, but it will generate a bunch of nonsense calls or emails on why the server is gone, when it in fact has just moved. I am still hoping to get fiber to my house. If that is the case, I will be moving AGOA to my datacenter offsite from the city. But if I end up quitting my job, I lose my chances of getting fiber. I guess only time will tell..
Premier_Pyrus is going to be developing mods and addons for Minecraft once and hopefully before the API is released. I hope to one day move away from bukkit and use stock Minecraft, and by using it’s API, mods will be more friendly with the architecture and cause less lag and stability. So, please hang tight. We are trying to get the game back to you. We’ll probably send out a news letter to everyone announcing the server is back, so look forward and keep in tune to our Facebook and forum posts. Does the Minecraft server still exist? Short answer, Yes. I know most of us have been studying or working on stuff at college, and so have I. I am doing my best to still manage everything, but it’s been hard. But enough about that, let’s talk about the server. Nations??? What? Yeah. We are now deploying them! We currently have seven nations. If you have not been paying attention lately, we have been cluttered with zones. So we are making nations to trim down the size. It is a group of five or more people under one area. So you and your friends (real life or on the server) can all build and play in the same area without having worry about outsiders griefing your area. But members inside your area can, so you have to be careful. One person in your group is the owner, and can add and remove members. Details can be found here. Oh, and here is a video of my coworker looking up my little pony. We tried to open our server to the public, but got a lot of annoying issues instead. In about a month, we had about 450 people join and leave the server. Not many of them played, but just joined and left. We did get a few more people to join and just stick around(10?). But we had a lot of issues with hacking and griefing. It was a pain to manage during the summer, and now it is an even larger pain to manage now that I am going to college. So I went and put the white-list back in to help people keep their stuff protected. Since we are moving to nations and zones, I figured we only really want people who play all the time. So if they want to play on our server, they have to register and be white-listed. I have made it easy to fill out, and it even sends you a nice pretty email once you have registered. That is pretty much it. I have added a white-list, and I expect some people to fill out the form, and I expect some players are too stupid to figure out how to do it, and leave the server. Either way it’s fine. I really don’t want idiots playing on the server. Today I had a major upgrade to our server, both virtually and physically… Well.. It is a virtual machine, but it falls under physical. Anyway, we went from 4gb of RAM to 6gb. I did some magic, and traded some stuff with the City of Sandy and got myself some more stuff. Our Minecraft server currently takes up 3gb, and the OS had only 1gb to share with two web servers and everything else. So now our server has 3gb to share and use in the operating system alone. I have already noticed a dramatic increase in performance. My laptop no longer glitches when I play on the server(may be unrelated issue). updating seems smooth, and things are just nice. I finally went and made another site, specifically for web hosting. It is more professional to do it this way instead of making it a part of AGOA and our gaming community. But now that that is up, things can return to normal and I can start working on the servers again. I am also trying to get a permanent server, or discover a way to bring fiber out to AGOA’s data center. If it is at all possible, it is at least a year out. Whether or not it happens, we’ll get a performance boost soon. You can view AGOA Hosting’s Adwords statistics here. If you read my earlier post on AGOA’s Minecraft State, You’ll understand that I have been trying to achieve new players and more traffic. Well I put my server up on a different list, and what do you know, I have more players. There is only on other problem. A lot of them are young. Which is annoying because all they have to say is “Can I be admin?” Besides that, some of them have decided to make AGOA their home. Which I have no problem with. To handle the new wave of people, I have installed Bukkit, with a few permission mods and anti-griefing mods. We have a new map rendering program, which is by far, much nicer than our old one. Admins have always been a gray area on my server, because I never ran any mods, and always just Oped people. Which when you get more admins or moderators, you’re going to have a bad time. I really think it is a bad decision on Mojang’s end for not creating a sort of second level, or one where you can have mods but no admins. So to solve this issue, I have to add permissions execute permissions for ever feature to every group. It’s really starting to become a pain. But besides that, we haven’t had any major problems. I need admins to help look over the map, clean up griefing and lava spreading. Because a lot of the map is protected, but a lot of it isn’t. And now that we are public, we have a lot more maintenance to do. I’ll leave with this. The MvM hype is over. My TF2 server is no longer popular. I have hit my highest ranking. Oh well. It was a fun week. And my Minecraft server traffic has gone up a bit. But we have a lot of work to do on it. So it has been three days since Valve released it’s first update of the Mann vs. Machine gamemode. It is pretty fun, and according to players, it is still Chaos with the servers. And it really is. I have found almost no guides to making a proper MvM server. Valve never released any documentation. It has taken a day for Google to cache the findings and now things are coming together. I found a good guide here. Anyway, my server has been running the new mode for three days with almost constantly full amounts of players. My stats have been kind of messed up though. I still have them running to monitor who is online. And so I can track some statistics. I use to be the top player on my stats, but now some guy named a fag has taken my spot… I was monitoring him. He was playing for a few hours on my server. I will get my top spot back. Soon. 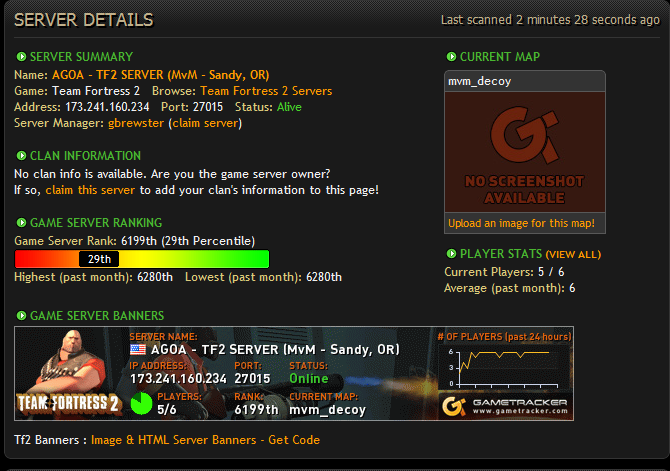 I have also set up my server to be monitored by Game Tracker. It makes everything look all pretty and such. Finally, yesterday I set up Cacti again to make sure I am not hogging traffic… I am not. The only time things jumped is when I used Netflix or downloaded something. So there you have it. This is what I have been doing in the past few days. It’s been a pretty good month for our Minecraft server. We have achieved four new players, and three of them play frequently. I have also started playing more. I have noticed that I get burned out on Minecraft ever once and a while, and it gets hard to get back into it. But I just like my job as admin. I am trying to provide new features for everyone to play on, and hope that maybe we can get this community to take of some more. I know TF2 is harder to get a community going (because it’s easy to switch servers), but why not Minecraft? It’s died down, but is nowhere near dead. I am aimed at providing a fun server for people to play on and start a community. So I am aiming at getting new players and have more people online. It finally happened. We have gotten our 5 usable public IP’s. Not really exciting, but it has eliminated the NAT issue my servers were having, and hopefully increase performance. Now that I have the IP’s, I need to use them. Which I would, but I don’t have the money. Anyway, AGOA is gone ahead and prepared for expansion, and we are looking into hosting Minecraft servers. But there isn’t much in it for us right now. If you have any ideas, let me know. But whatever, Just telling you guys what’s up.